Arms are thrust in the air for the final headliner of the three day festival. A massive crowd gathers in the huge amphitheater surrounded by towering sets of fire and massive light projections. Dimitri Vegas and Like Mike pull out of their set for a moment and hypnotic words over the system invite the crowd to 'Join as we release the illumination.' Everyone's wristbands suddenly light up -- ten thousand hands raised together to drive home the peak of the final night. It's an amazing moment and a symbol of the new elements that technology is constantly bringing to the festival experience. Top EDM DJ Hardwell shares his thoughts on it's role: "Technology has grown to play one of the most important roles in the festival experience. From lighting to visuals to live streams, it has added an entirely new dimension to live performances." TommorrowWorld is a completely cashless festival, these same wristbands lighting up the dance floor are being used for all transactions and can even sync with those around you and connect you on Facebook. The dance music festival has long been a champion in Europe, but is quickly gaining momentum in the US on the back of EDM's popularity. I chatted with Joe Silberzweig, Marketing Manager of TomorrowWorld, owned by SFX Entertainment Company, "Millennials are an experience generation, they want you to take them somewhere totally unique." Set on over 8 acres of farmland, TomorrowWorld is a canvas to do just that. 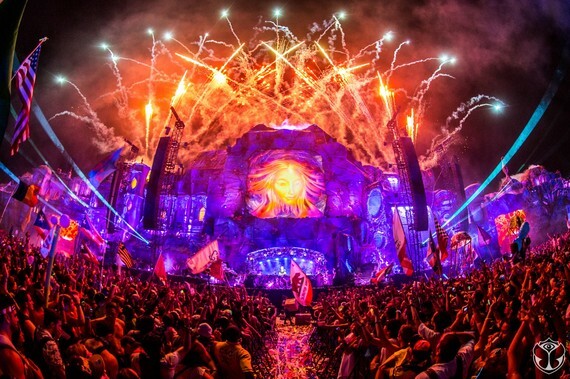 TomorrowWorld came from the massively successful TomorrowLand festival in Belgium. SFX is constantly working to extend the festival experience to those that can't physically be there, or to those who were and want to remember it. They are famous for their festival videos, typically racking up over 100 million views on YouTube. In 2014, they wanted to do something more to engage their massive audience throughout the year, helping them relive the festival or build anticipation for the coming year. YouTube would again be live streaming the event, but they wanted to go a step further. 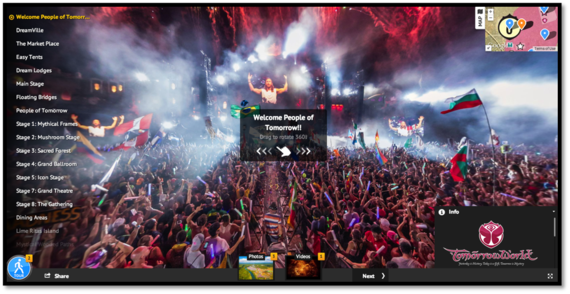 The SFX team explored a wide range of technology with a vision for evolving the online festival experience. Finally they settled on a partnership with a leading virtual tour startup called YouVisit. "We thought about drones, blimps and timelapse," said Joe, "We clicked with YouVisit, they understood what they were about and brought to the table what they have built: a powerful platform." To capture the experience PJ Morreale, YouVisit's senior director of operations, created a one-man custom camera rig featuring multiple DSLR cameras, enabling him to capture high definition 360 photos throughout the event. 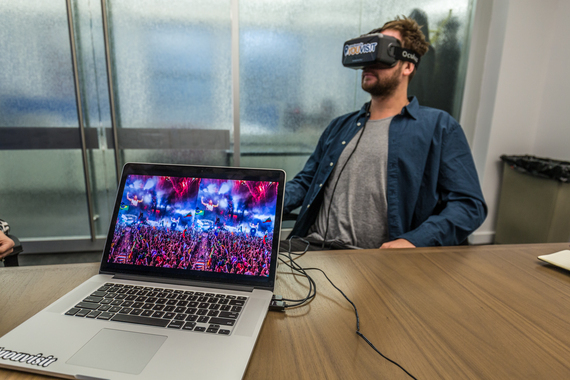 The result is a virtual festival experience that allows you to explore the entire festival, from the campgrounds to heart of the dancefloor. 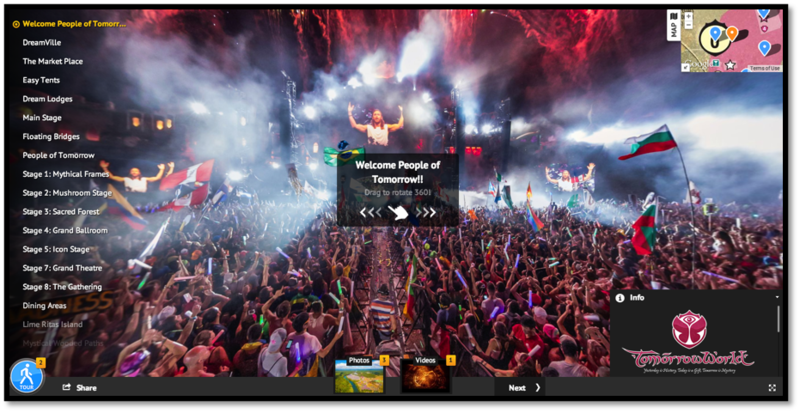 Watch stunning sunsets or see what the world looks like from the perspective of a headlining DJ. In the YouVisit office in New York, Morreale and his colleague Endri Tolka, YouVisit's COO/CFO, shared how they wanted to take users places where no one gets to go, giving people the chance to experience something they may have never have had the chance to go to. When the virtual tour was released on the web, fans from all 50 states and over 100 countries engaged with it: Fans reliving the festival, others around the world seeing it for the first time. Viewable within a browser, even optimized for smartphones, the average engagement with the tour was ten minutes, which is huge. It helped build excitement for the release of 2015 tickets, of which 360,000 were sold in under an hour. This type of digital engagement is essential as festival brands seek to remain connected with their audience throughout the entire year. Technology is playing a huge role in creating original experiences for audiences, from Hologram performances from TuPac to 3D projections that place the performer in some kind of action movie. Millennials want to experience something unique that they can be a part of and share with the world. And what would a virtual festival experience be without bringing it to life with Oculus Rift? In New York, I was able to try out the TommorrowWorld virtual tour on a recent developer version of the latest Oculus Rift hardware and via mobile using Google Cardboard. As a version one, I've got to say it's pretty amazing, you can navigate between various environments by focusing on one point and twist you head right around exploring the crowds and chillout zones. The photos are stunning, allowing you to gaze off at sunsets or feel a part of the crowds going crazy. It won't be long until anyone with a Oculus Rift or VR setup for their phone will have the opportunity to be transported into the festival experience from the comfort of their couch, reaching for the popcorn instead of reaching for the lasers. The potential of virtual reality and music festivals is huge, and TommorrowWorld has plans to continue to push the boundaries, bringing more content and unique angles to the platform. Artists will likely start to offer their own virtual reality experiences, which may prove to be a huge revenue opportunity as the music industry revenue model focuses on rich content to supplement streaming. Imagine being able to hang out backstage with a DJ before going on stage with them, exploring what it feels like from their perspective. "There is no comparison between watching an artist online versus in person. The energy, emotion, and community that the festival experience provides is unattainable." Said Hardwell, "That being said, live streams have provided a new way for people to have the second best thing when they can't attend a festival and I could definitely see virtual reality becoming a part of the experience in the future."